Like the Roman legions centuries before them, Napoleon Bonaparte's armies carried eagles proudly at their head. 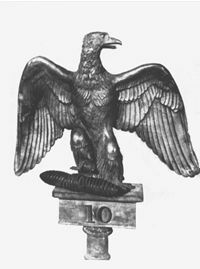 Introduced in 1804, the eagles sat atop blue regimental flagpoles, were sculpted out of bronze and weighed 1.85 kilograms (about four pounds). They were made from six separately cast pieces designed along Roman lines and, when assembled, measured 310mm in height and 255mm in width. On the base would be the regiment's number or, in the case of the Guard, Guarde Imperiale. To lose an eagle would bring shame to a fighting unit, which had pledged upon the symbol's receipt to defend it to the death. One of the most celebrated losses of an eagle came at Waterloo, where Sergeant Charles Ewart of the Scots' Greys captured the cuckoo, as it was nicknamed, of the 45th Line Regiment. For his bravery - he killed at least three defenders - he was given a commission as ensign. Many units - particularly dragoons, line and light infantry, were ordered to return their eagles before setting out on a campaign. Many disobeyed the order. There are legendary tales of those guarding the eagles to have suffered numerous wounds - including mortal ones - in defending their precious possessions. Upon Bonaparte's fall, the restored monarchy of Louis XVIII ordered all eagles to be destroyed and only a very small number escaped the vengeful act. When the former emperor returned to power in 1815 he immediately had more eagles produced, although the quality did not match the originals. The workmanship was of a lesser quality and the main distinguishing changes had the new models with closed beaks and they were set in a more crouched posture. After Waterloo, many eagles were again destroyed - almost 100 of them - but today there are a little over 130 in existence.